128.05 397.0 348.4 289.2 TRACON PIT/UPT CAT VI TRAINING AREA(DO NOT ADVERTISE. CTN: DUE CONST UFN; ATCT UNABLE TO OBSERVE TFC ON SE PORTION OF ARPT. TWR INSTRUCTIONS ON TWYS & RAMPS IN THIS AREA WILL BE ADZY ONLY. SMALL ACFT DEPARTING RWY 3 ANTICIPATE TKOF FM INT TWY G.
ASR-9 ELEV 865 FT. CPME JUDSON 29-32-39.3342N 098-21-19.3004W. CPME QNA 30-05-06.0069N 100-21-51.9579W. CPME RSG 29-21-40.5476N 097-03-59.7940W. CPME SAT 29-31-37.2354N 098-28-33.0040W. Southern Texas Piper Sales, Inc.
A110-12 GLIDER/SOARING OPNS APRXLY 17 MILES NW OF ARPT DURG VFR. A110-14 TWY D NON-MOVEMENT AREA FM TWY N TO 500 FT W OF TWY N.
A110-16 NOISE SENSITIVE AREAS EXIST ON ALL SIDES OF ARPT, AT PILOTS DISCRETION CLIMB AS QUICKLY AND QUIETLY AS SAFELY POSSIBLE ON DEPARTURE AND USE CONSIDERATION WHEN FLYING OVER POPULATED AREAS BY MINIMIZING FLT AND HIGH PWR SETTINGS. MILITARY AIRCRAFT: DEPARTING AND ARRIVING AIRCRAFT WILL USE MINIMUM POWER SETTINGS CONSISTENT WITH AIRCRAFT FLIGHT MANUALS, AFTERBURNER TAKEOFF IS PROHIBITED UNLESS REQUIRED FOR SAFETY OF FLIGHT. ENGINE-UPS ARE PERMITTED BTN 0600-2300. A110-17 ACFT TAXIING ON RY 04 NE BOUND LOOK FOR HOLD SHORT TO RY 31L. A110-18 ACFT TAXIING ON TWY N SW BOUND LOOK FOR HOLD SHORT TO RY 31R. A110-19 WORK IN PROGRESS SCHEDULED MAINTENANCE ON & ALONG TWYS AND RAMPS AREAS AT VARIOUS TIMES. A110-20 GROUND RUN-UP ENCLOSURE AVBL 24 HRS. 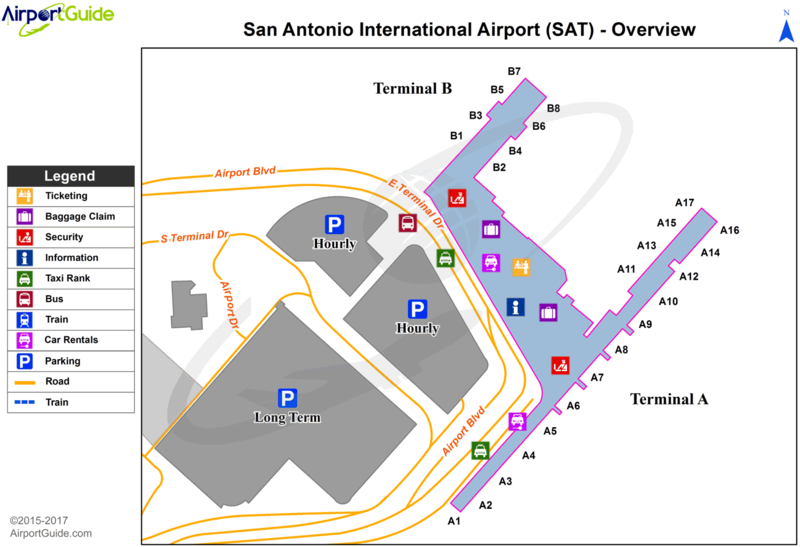 A110-21 TERMINAL GATES A1, A5, A6, A7 & A8 USE ONLY WITH PPR CALL OPNS 210-207-3433. A110-24 RY 13L/31R NOT AVBL FOR PART 121 ACR OPNS. A110-25 THE FOLLOWING TWYS ARE NOT AVBL FOR ACFT 59,000 LBS OR OVER: TWY A & TWY J NORTH OF RY 13R-31L, TWY M & TWY P, TWY H NORTHWEST OF TWY Z AND TWY E EAST OF RY 04/22. 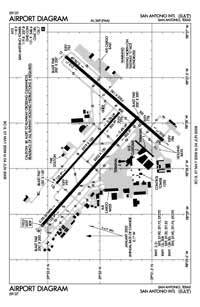 A110-26 TWY Z CLSD TO ACFT WITH WINGSPAN GREATER THAN 118 FT.
A110-27 C130 AND C17 TYPE ACFT MUST PARK ON WEST RAMP TO CLR CUST. A110-31 INNER RAMP TAXILANE NORTH OF TRML A AND B IS CLSD TO ACFT WITH WINGSPAN GTR THAN 135 FT.
A110-33 PPR WITH ARPT OPNS FOR ACFT POWERING BACK FM TERMINAL GATES. A110-34 TWYS L & B CLSD TO ACFT WITH WINGSPANS GREATER THAN 118 FT EXITING RY 31L. A110-35 A BARRICADED PAVEMENT ELEVATION CHANGE EXISTS ALONG THE EASTERN SIDE OF THE WEST RAMP. A110-36 FREQUENT RUBBER ACCUMULATION NW 2500 RY 13R/31L. A110-38 ACFT AT TERMINAL A & B ADVISE GND CTL PRIOR TO PUSH. A110-39 COMPASS DEVIATION MAY OCCUR AT THE NW PORTION OF TWY R DUE TO REBAR RE-ENFORCED CONC BRIDGE LCTD UNDER THE TWY. A110-4 TWY L CLSD NORTHBOUND. A110-41 TWY R WEST OF TWY D CLSD TO ACFT OVER 270,000 LBS. A110-45 AERODROME ALL SFC WIP CONST FOR CURRENT INFO CTC OPS. 210-207-3433. A110-46 ARPT RSTD TO ACFT WITH WINGSPAN GTR THAN 171 FT, PPR WITH 24HR OPS 210-207-3433. RQRD FOR AUTH. A110-47 TWY R BTN APCH END RWY 13L AND TWY D CLSD TO ACFT WINGSPAN MORE THAN 135FT. TWY S BTN APCH END RWY 13L AND RWY 13R/31L CLSD TO ACFT WINGSPAN MORE THAN 135FT. A110-49 APRON EAST CARGO RAMP INT OF RWY 04/22 AND TWY DELTA ACFT ARE REQ TO APPLY THE MNM THRUST WHEN XNG THE RWY TO AVOID DMG DUE TO JET BLAST. A110-50 ALL INTL GENERAL AVIATION CLEAR U.S. CSTMS AT NORTH FIXED BASE OPERATOR RAMP EAST SIDE, CALL U.S. CSTMS 210-821-6965 UPON ARR. A110-51 ALL ACFT AFTER LDG ON RWY 13R/31L EXITING SOUTHWEST BOUND ON TWY DELTA TO MAKE 90 DEG TURN ON TWY GOLF TO AVOID NEWLY LAID UNUSBL SFC. A110-52 FOREIGN MIL ACFT WITH WINGSPAN LESS THAN 100 FT MUST REP TO GA RAMP FED INSPECTION STATION FOR CUST PROCESSING, CTC AP MANAGEMENT AT 210-207-3433. A110-7 NUMEROUS FLOCKS OF BIRDS INVOF ARPT.